Has the first season of the Manifest TV show reached new heights for NBC? 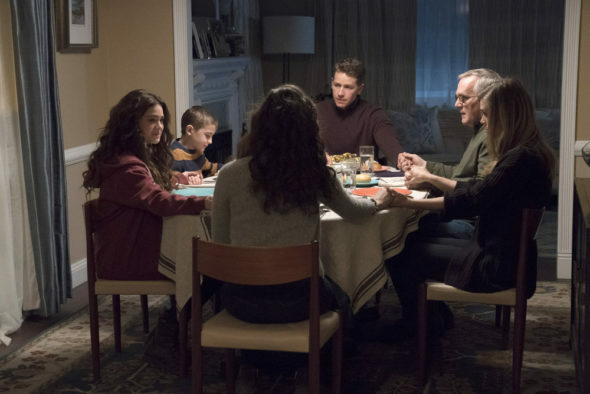 As we all know, the Nielsen ratings typically play a big role in determining whether a TV show like Manifest is cancelled or renewed for season two. Unfortunately, most of us do not live in Nielsen households. Because many viewers feel frustration when their viewing habits and opinions aren’t considered, we’d like to offer you the chance to rate all of the first season episodes of Manifest here. *Status update below. An NBC drama series, Manifest stars Melissa Roxburgh, Josh Dallas, Athena Karkanis, J.R. Ramirez, Luna Blaise, Jack Messina, and Parveen Kaur. After a family vacation in Jamaica, the Stone family is returning to New York when they are separated by the airline. Adult siblings Michaela (Roxburgh) and Ben (Dallas), along with Ben’s gravely ill son Cal (Messina), are bumped to a later flight. Ben’s wife Grace (Karkanis), daughter Olive (Blaise), and parents fly ahead. The later flight — Montego Air Flight 828 — hits some turbulence but ultimately lands safely. The flight crew and passengers are shocked to learn that five and a half years have passed for the rest of the world. They attempt to reconnect with their loved ones while trying to make sense of their mysterious “second chance”. What do you think? Which first season episodes of the Manifest TV series do you rate as wonderful, terrible, or somewhere between? Should NBC cancel or renew Manifest for season two? Don’t forget to vote, and share your thoughts, below. *5/15/19 update: NBC has renewed their Manifest TV show for a second season. More about: Manifest, Manifest: canceled or renewed? Love the storyline. One of the shows I anticipate on seeing every week. I love the show! It keeps you guessing and loooking for new clues every week. I hope it gets renewed for another season! Great story. Keeps you on the edge of your chair. Acting is excellent. Well worth watching. I’ve already stopped watching it. Manifest is a flop. I to will stop watching, this last episode was a waste of one hour – a child w/a fever. Will start watching “Bull” again. Excellent series. Very good plot/story. Loved both episodes so far and will continue to watch. Will recommend to others too. Thanks! Very good pilot show. Loved the characters even though the premise is a little wonky. Sometimes wonky can be good. Love, love, love Josh Dallas. Like I tell my husband, IT IS TV. use your imagination. Life plays in the background. I really enjoyed the first episode and this show has great potential. I will continue to watch it, and look forward to the next episode as long as it doesn’t turn anti-Christian. I completely lost interest 30 minutes into episode 1. This seems to be a total knock off of The 4400. Granted, there are a few twists but the entire premise is too similar. Don, I agree. I watched the Pilot and had that same deja bu that I had the feeling on revamping The 4400. I watched the next week for 20 minutes and thought, “been here, done this”, and read a book.